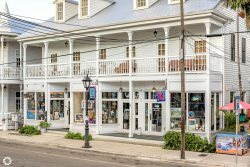 Located on Southard Street right next door to the Five Brothers Grocery (the best con leche and Cuban sandwiches on the island), this beautiful historic conch style cottage is in a neighborhood of some of Key West's best restaurants. Mangia-Mangia, Michael's, Azur and Cafe Sole to name a few! Just four short blocks to the Historic Seaport and the infamous Duval Street, Conchy Tonk will make you feel right at home either sitting on the front porch, watching the world go by or enjoying the totally private landscaped backyard with built in grill, relaxing eating area, heated pool and outdoor shower. Completely renovated, Conchy Tonk is a true home away from home with central air conditioning featuring two bedrooms, each with TV (Direct TV) and DVR or DVD player. The downstairs bedroom includes a queen size bed and adjacent full bathroom with claw footed tub and shower. The upstairs bedroom includes a king size bed with adjacent half bathroom. With beautiful Island decor, the living room has a queen sleeper sofa, a stereo, large HD television, stereo with CD player and a DVD. Stay in touch with family and friends or if you must work, your quaint island home is equipped with hi-speed Internet. The delightfully equipped kitchen includes new quartz counter tops, dishwasher, stainless farmhouse sink, microwave, refrigerator, ice machine, glass top stove, garbage disposal and wine cooler. All utensils provided to cook, prepare and serve a gourmet feast! Or grill your fresh catch on the built in BBQ grill by the pool. Outdoor kitchen for entertaining with large gas grill and stainless sink. Fort Zachary State Park Beach Pass provided. Housekeeping provided upon request at $25 per hour. Sleeping Arrangements: (1) King Bed, (1) Queen Bed, (1) Queen Sleeper Sofa. Blocks to Duval: 5 blocks.